Showers & Eyebaths Services has upgraded its Bowser Emergency Shower to give a superior self contained mobile body, face and eye wash facility which fully complies with the recommended regulatory 15 minutes of uninterrupted dousing. With the additional facility to retain heated water at 20º for up to 12 hours, it is now possible for this unit to operate in inhospitable, remote and hazardous conditions while also providing a cost effective solution to industries that are either on the move or do not want to go to the expense of plumbing in a fixed facility. As the only mobile unit of its kind on the market, according to Showers & Eyebaths Services, industries including oil and chemical companies have already placed orders, seeing this facility as more cost effective than having to dig up existing infrastructure to plumb in fixed units. Craig Yates, managing director of Showers & Eyebaths said: “Many industries are constantly on the move or work in remote areas or quite simply need to have an emergency shower facility that can follow where the work is. 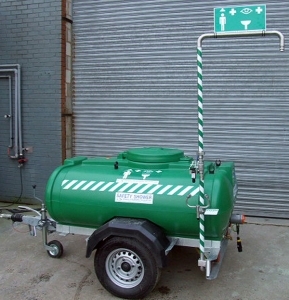 The GPS12 is manufactured in house with a stainless steel shower & eyewash and is ATEX approved.